410ce-SLTD, Acoustic-electric Folk/Western guitar from Taylor in the 2014 Spring Limiteds series. 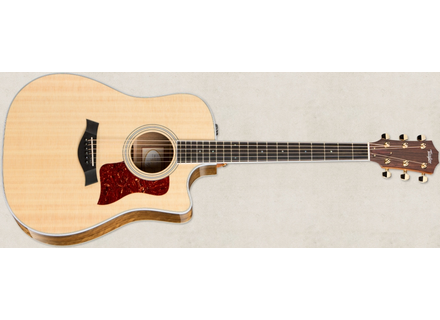 Along with the 320e-Baritone, the Taylor Spring Limiteds Series features five 400-series electric-acoustic guitars. The Taylor 410ce-SLTD, 412ce-SLTD, 414ce-SLTD, 416ce-SLTD and 456ce-SLTD (12 strings) all feature Sitka spruce top, ovangkol back and sides and venetian cutaway. All the guitars also include a Taylor Expression System 2 piezo and preamp system. The 410ce-SLTD has a dreadnought body-style with tropical mahogany neck, ebony fingerboard with 20 frets and a 25.5” scale length. You’ll also find on this guitar a Tortoise pickguard and golden tuner buttons. MSRP is $2658. The 412ce-SLTD is a Grand Concert model with tropical mahogany neck, ebony fingerboard with 20 frets and Dot Abalone fret and ebony bridge pins inlays. The scale length is 24-7/8” and you’ll find a Tortoise pickguard and golden tuners. MSRP is $2658. The 414ce-SLTD has a Grand Auditorium shape and features the same specifications as the other Spring Limiteds models, with a 25.5” scale length and the same MSRP ($2658). The 416ce-SLTD also offers the same features in a Grand Symphony-style instrument. MSRP is also the same. Last, the 456ce-SLTD is a 12-string Grand Symphony model with mahogany neck, ebony fingerboard with 20 frets and 25.5” scale length. MSRP is $2858. Visit www.taylorguitars.com/guitars/limited-editions/spring-2014 for more info about these new Spring Limiteds guitars. Seymour Duncan launches a triple cream humbucker Seymour Duncan announces the release of the Triple Cream LD Model pickup, a triple humbucker for guitar available with a full cream finish. Dean Markley introduces Helix PureNickel strings Dean Markley now offers its Helix strings for electric guitar in PureNickel Electric versions.